Original plantation lands were located off Highway 61. Origin of name  It is believed the name Runnymede was chosen due to the property's great oak and location along a river similar to the Runnymede in England. 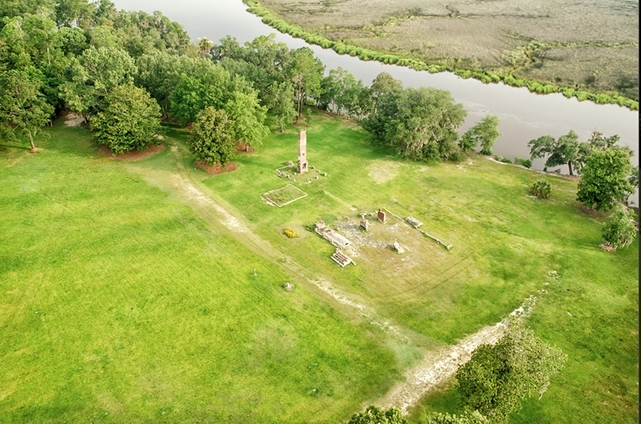 John Cattell received a grant for 300 acres on the south side of the Ashley River. The property eventually passed to his eldest son, John Cattell (2, p. 17). 1777  Abraham Ladson purchased the 45 acres of the property. He sold off 5 acres and kept the rest. At his death, the property went to Lambert Lance and then to John Julius Pringle. Up to this point the plantation had been known as Greenville. John Julius Pringle changed it to Sarah Place after his wife. The original house had been destroyed by fire prior to Pringle's purchase. Pringle constructed a new plantation house and when it was complete, the plantation became known as Runnymede (2, p. 18). 1841  John Julius Pringle died. The plantation went to his son, William Bull Pringle (2, p. 18). 1845  William Bull Pringle added 500 acres to the property. The acreage was part of Fuller Plantation (2, p. 18). 1862  William Bull Pringle sold Runnymede. At the time the acreage totaled 1,457 (2, p. 18). 1865  The plantation house built by John Julius Pringle was destroyed by the Union army. It is believed that Charles C. Pinckney owned the house at this time (2, p. 18). He used the property for phosphate mining (2, p. 18).
?  Pinckney built a house at Runnymede. 1995  Runnymede remained in the Pinckney family for over a century until Floyd and Shirley Whitfield purchased it in 1995. 2002  A fire of unknown cause destroyed the house built by Pinckney.